There was some inexpressibly cool and unhurried sense of peacefulness that exuded from the man. The year was 1997, November 5 to be exact. I was attending an inter-faith conference at a small town about an hour's drive from Phnom Penh. He was there among the crowds who came to give their blessing to the opening of the auspicious event. I felt something special about this frail but ever-smiling monk although I couldn't tell why. "Oh, that is Venerable Maha Ghosananda; he is very famous in Cambodia," whispered Buddhist scholar Chatsumarn Kabilsingh, urging me to interview him. So I did. But as obliging as Maha Ghosananda was with a then green-horn journalist like me, I found it extremely difficult to write an article on him. He talked very little about his personal life, which Acharn Chatsumarn (who was later ordained as Bhikkhuni Dhammananda) said was so fascinating. Throughout the brief conversation I had with him, Maha Ghosananda would make extensive references to "dharma" - the importance of keeping oneself aware of the rising and ebbing away of mental phenomena, pleasant or not, how to constantly cultivate loving-kindness toward every sentient being, and last but not least, how not to cling to anything. I accept the truth of the adages, but they were, well, (given my ignorance at the time) hard to put in a newspaper. His name, and that mysteriously cool aura, has however been an enigma for me. Every now and then I would come across some mention about or by him. He has been called the "Gandhi of Cambodia", the "Buddha of the Battlefields", and in the words of the late Dith Pran (whose life inspired the film The Killing Fields), the "dreamkeeper" of his homeland. In the 1990s, King Sihanouk conferred on him the special title of "Leader of Religion and Peace", and later "International Patriarch". He received numerous awards for his peace activism, including being nominated a few times for the Nobel Prize. His dharmayietra (literally "Pilgrimage of Truth") movement, which he initiated in 1992 with friends from different denominations, has since been carried on in his homeland, and later adopted elsewhere, including in Thailand (albeit totally different from the one recently staged during the dispute over the Preah Vihear world heritage site). In the late '70s, he helped set up hut temples at the refugee camps along the Thai-Cambodian borders, and later to rebuild temples and provide education to hundreds of monks and nuns in Cambodia (it was estimated that of about 65,000 monastics, only 3,000 survived the Khmer Rouge era). He also founded over 30 home-based temples in North America, Europe and Australia for the Cambodian migrant communities there. The more I learned about Maha Ghosananda's biography and the tortuous history of Cambodia, the more I appreciate and marvel at his ability to remain unperturbed, so refreshingly serene in the midst of raging fires. I would have the same question once raised by Benedictine monk James Wiseman: "Looking at the Venerable Ghosananda, one has the impression that not only his smile, but his whole body is radiant. It seems as if his skin has been washed so clean that it shines. One can only wonder what this man has seen, what he has experienced of the terrible killing fields in his home country (considering that all the members of Maha Ghosananda's family died under the Khmer Rouge regime of Pol Pot). "One thing however is obvious: Whatever his experience has been, it has brought forth extraordinary growth in the spiritual life." Of his early years, there is sketchy, rather scattered information. His date of birth varies - it was some time in the 1920s - depending on the source. It was reckoned, though, that Maha Ghosananda's potential may have been recognised not long after his ordination, for he came under the tutelage of Venerable Chuon Nath, later appointed to be the Supreme Patriarch and a key leader of the reformist movement in Cambodian Buddhism in the early 20th century. In 1951, he left for a study at Nalanda University in India (where he would be eventually granted a PhD which he jokingly translated as "Person Has Dukkha" - suffering). Importantly, while in India, Maha Ghosananda had an opportunity to learn about the Gandhian philosophy of non-violence with Nichidatsu Fujii, a disciple of Mahatma Gandhi and the founder of Nipponsan Myohoji, a Japanese Buddhist order dedicated to world peace. After his time in India, Maha Ghosananda reportedly travelled extensively to different temples throughout Asia, returned to Cambodia briefly before a long spell of residence in Thailand (the exact number of years is not known). It was said he studied Vipassana (insight) meditation with Ajahn Dhammadaro in Nakhon Si Thammarat, but an obituary written by his long-time friend Sulak Sivaraksa last year also mentioned reformist monk Buddhadasa as another mentor of Maha Ghosananda. "He learned that his parents and all his brothers and sisters had been murdered. He was told, over time, of the death of many of his fellow monks and nuns. And of course, he said, he wept for so many losses. He wept for his country. He wept, he said, every day and could not stop weeping. But his teacher urged him to stop. Don't weep, he was told, Be mindful. "Having mindfulness, his teacher said, is like knowing when to open and when to close your windows and doors. Mindfulness tells us when is the appropriate time to do things - you can't stop the fighting. Instead, fight your impulses toward sorrow and anger. Be mindful. Prepare for the day when you can truly be useful to your country. Stop weeping, and be mindful!" We will never know how and for how long before the inner battle came to an end. By 1978, Maha Ghosananda embarked on a mission to bring peace to his fellow Cambodians. In an introduction to his only book, titled Step by Step - Meditations on Wisdom and Compassion, editors Jane Sharada Mahoney and Philip Edmonds related the monk's visit to a refugee camp in Sakeo. Amid the bleak and dilapidated atmosphere, Maha Ghosananda's presence was like a glowing candle that rekindled the spiritual warmth long suppressed by the protracted wars. "In that moment," Mahoney and Edmonds write, "great suffering and great love merged. Centuries of Buddhist devotion rushed into the consciousness of the refugees. Waves of survivors fell to their knees and prostrated, wailing loudly, their cries reverberating throughout the camp. Many say that the Dharma, which had slept gently in their hearts as the Bodhi tree burned, was reawakened that day." Maha Ghosananda himself would later stress the duty of socially-engaged Buddhists: "We must find the courage to leave our temples and enter the temples of human experience, temples that are filled with suffering. If we listen to the Buddha, Christ, or Gandhi, we can do nothing else. The refugee camps, the prisons, the ghettoes and the battlefields will then become our temples." There is no discrimination either between ideologies or on the basis of past conflicts. Maha Ghosananda's temple huts catered to all refugees alike, including former Khmer Rouge soldiers. "We have great compassion for them because they do not know the truth," he later told film producer Alan Channer. "They suffer so much; they burn themselves. They want peace; they want happiness and Buddhism gives them peace and happiness. "I do not question that loving one's oppressors - Cambodians loving the Khmer Rouge - may be the most difficult attitude to achieve. But it is a law of the universe that retaliation, hatred, and revenge only continue the cycle and never stop it. Reconciliation does not mean that we surrender rights and conditions, but rather that we use love in our negotiations. It means that we see ourselves in the opponent - for what is the opponent but a being in ignorance, and we ourselves are also ignorant of many things. Therefore, only loving-kindness and right mindfulness can free us." It is a message that he would repeat the rest of his life. During the top-level talks between different Cambodian warring factions in France, Switzerland, and Indonesia, Maha Ghosananda led his contingency of monks, "the fifth army of peace", to open daily sessions with prayer and meditation; they implored the leaders to recall their Buddha nature, and reminded everyone of the power of non-violence. Sulak recalled the monk had personally asked him to seek holy water from the Supreme Patriarch at Wat Bowon Niwet in Bangkok to sprinkle on the Cambodian representatives - an initiative that was unanimously welcomed by all parties. In her article on the dharmayietra movement in Cambodia, Kathryn Poethig wrote: "For Maha Ghosananda, the essence of Buddhist dharma is the practice of peacemaking. It requires skilful means, the ability to listen with compassion to the perspective of the one who has done you and others harm, and being mindful and selfless in negotiating a peaceful resolution to conflict." Ingenuity and patience are certainly key. Maha Ghosananda often talked about how "wisdom and compassion must walk together. Having one without the other is like walking on one foot; you will fall. Balancing the two, you will walk very well, step by step." In 1992, as the refugee camps were preparing to close with the planned repatriation of some 350,000 Cambodians, Maha Ghosananda and his friends from various faith groups launched the first dharmayietra. Over a hundred Cambodian refugees, escorted by international walkers including monks from Thailand, Sri Lanka and Japan, did the arduous 450km trek from the Thai borders back into their homeland. Every day, the returning Cambodians found their long-lost family members. By the time the band reached Phnom Penh, their number had swollen to more than a thousand. The first few walks have been wrought with great difficulty. For the inaugural walk, most of the senior monks invited declined to join; it took a while to get permission from the Thai, Cambodian, and UN officials for the refugees to cross the borders. The subsequent ones fared no better; landmines and exchanges of gunshots and grenades between the Khmer Rouge and government troops were still the norm. During the third walk, in 1994, a skirmish caused by a misunderstanding ended with a monk and a nun killed, a few participants injured, and some taken hostage (though they were later released). But the peace walkers did not waiver. For Maha Ghosananda, the dharmayietra was not a political demonstration - they discouraged any effort by public figures to co-opt the event - or a new innovation into Cambodian Buddhism. It was simply following the example of the Buddha, he cited, who long ago had walked right onto the battlefield in an effort to end a war and bring reconciliation to two hostile factions of his own clan. In Venerable Santidhammo's biography, moving accounts of those who participated in the walks reveal the beauty of humanity, if given a chance to grow. The dharmayietra heralded the end of the war, reunited families, inspired new vision. A number called the experience Dhamma Teak Tong, or "Dhamma Contact". For at that very moment, all the boundaries melt; any notions of "us" versus "them" are tossed away. One local woman said: "We Khmer haven't seen peace for so long. We've never known it. Now seeing the monks and all these people walking makes me think they've come to teach us to love one another, to unite. When I see them I feel speechless. Maybe we will have true peace after all." Due to his fragile health, by 2000, Maha Ghosananda could no longer attend the dharmayietra walks, which have since been done on more localised scales, with the themes ranging from environmental to human rights, Aids, and youth issues. 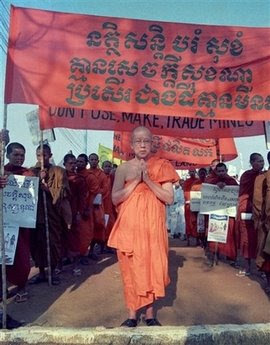 According to Peter Gyallay-Pap, founder and executive director of the Khmer-Buddhist Educational Assistance Project (KEAP), the spirit of the monk has been carried on by his followers who seek "change in terms of actively following the middle path, not in social or political confrontation". But will true transformation ever come? To Cambodia and the rest of the world? On the last page of his book Step by Step, Maha Ghosananda expressed his faith in the practice of mindfulness as "the only way to peace". "Slowly, slowly, step by step," he urges. "Each step is a meditation. Each step is a prayer." On March 12, 2007, Maha Ghosananda passed away at a temple in Lowell, Massachusetts, one of the many sanctuaries he had built for his fellow Cambodians around the world.